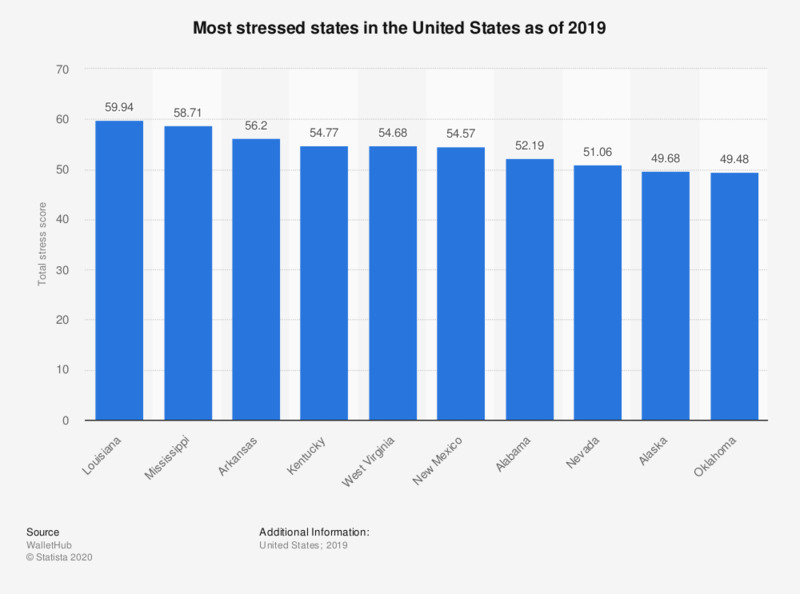 This statistic shows the most stressed states in the United States based on select measures as of 2018. According to the data, Louisiana was the most stressed state, followed by New Mexico and West Virginia. "In order to determine the most and least stressed states, WalletHub compared the 50 states and the District of Columbia across four key dimensions: 1) Work-Related Stress, 2) Money-Related Stress, 3) Family-Related Stress, 4) Health- & Safety-Related Stress. We then determined each state’s weighted average across all metrics to calculate its overall score and used the resulting scores to rank-order our sample." When it comes to your finances, which of the following habits do you feel causes you stress? To what extent do you feel that concerns about the cost of housing cause you stress? To what extent would you support or oppose more homes being built in your local area?